Hamas terrorists fired a large number of rockets at central Israel Thursday morning. No injuries have been reported. Hamas terrorists launched a major attack on Israel's heartland Thursday morning, as Red Color alert sirens were sounded in communities throughout central Israel. Sirens were sounded in Tel Aviv and its suburbs, Raanana, Hadera, and in the Netanya area as well. Iron Dome batteries shot down several of the missiles, with others falling in open areas. No injuries have been reported. Minutes before, a barrage of rockets was fired at Beersheva. 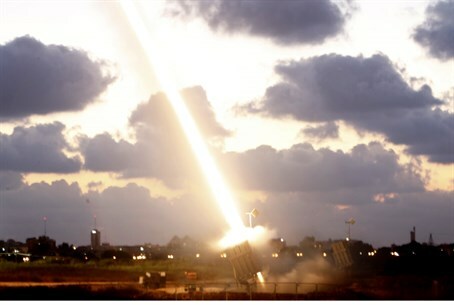 The Iron Dome system knocked out four of the missiles. No injuries have been reported. On Wednesday night, the UN called for a “humanitarian cease-fire” that would last for six hours, to enable Gaza residents to stock up on supplies, but the Egyptian proposal would set a more long-term cease-fire. That cease-fire was set to go into effect 10 AM Thursday morning local time. Reports Thursday morning said that Israeli and Hamas negotiating teams had arrived in Cairo to discuss the more permanent cease-fire proposed by Egypt. The cease-fire was first proposed by Egypt Tuesday night and was accepted unilaterally by Israel, as Hamas continued to pound Israel with rocket fire. Later Wednesday, Israel responded to the Hamas attacks, striking back at terror targets in Gaza. Israeli officials have said publicly that their objective in Operation Protective Edge is to restore quiet to Israeli cities. But government sources quoted in the media over recent days said that Israel also had demands for implementing a cease-fire, specifically international supervision of the dismantling of Hamas' rocket and missile supply.